Author J.B. Simmons blogs on creative writing, editing, publishing, and music. He is the bestselling author of seven books that bring hope to dystopia. Readers can't put them down. November 2018 marks the release of The Blue Tower, the first book of a YA series about a boy who wakes up in a mysterious tower with no memories of his former life. He must learn who he was before he can figure out why he's here...and how to get out. What makes a bestseller? The story has to be gripping. The characters have to be real. And the words have to let all kinds of readers find meaning — something that matters for their own lives. Maybe that's why the endings of so many great books are open to interpretation. They guide readers toward their own conclusions. This might help explain why the bestselling book of all time has such a crazy final chapter. This is the first of a four-part series on that wild old book: Revelation. Seriously, Someone Put This In The Bible? 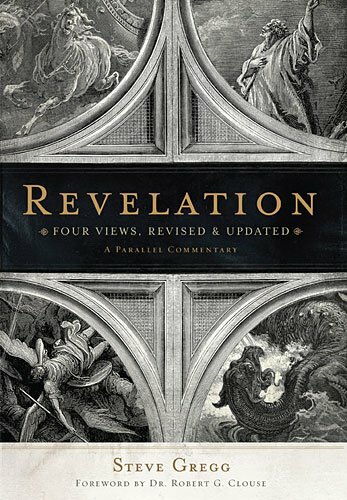 If you haven't read Revelation, or if it's been a while, let me give you a quick refresher. A guy named John wrote it. He wrote the book while banished on a small island. A vision comes to him. Someone "like a son of man" tells him to write down what he hears and sees. So he does. First comes seven letters to seven churches. That's practical, pretty normal. But then comes the Throne of God. It's surrounded by four creatures "full of eyes" and with six wings each. I doubt you've seen one of those. Not even Guillermo del Toro could top it. From there seven seals are opened, seven trumpets blown, and seven bowls poured onto earth. That makes some stuff happen. No big deal. Just stuff like a pale horse ridden by Death and every mountain and island removed from its place. Maybe a little mayhem, too: earth burns, stars fall, a bottomless pit opens, plagues kill a third of mankind, and a bunch of locusts with human faces, lion teeth, and scorpion tails fly around. Oh, and the sea turns to blood, everything in it dies, and total darkness falls on the world. 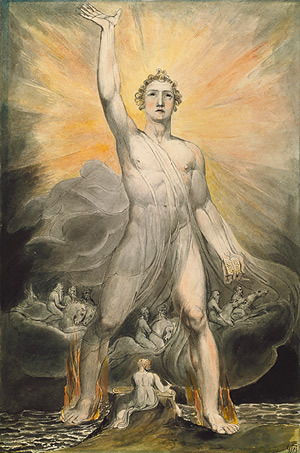 William Blake, Angel of the Revelation. See that little scroll in his hand? John ate it. Aside from that chaos, there's also war breaking out in heaven and on earth. A fiery red, seven-headed dragon tries to eat the child of a woman clothed with the sun. An angel named Michael throws the devil out of heaven. Beasts arise from the sea and the earth. The great city of Babylon is destroyed. The Lord of lords rides in on a white horse and, with a sword from his mouth, defeats the enemy. Now, remember the banished writer, John. Quite a sight for him, right? In the midst of all that, he must have gotten tired. Good thing an angel came down and gave him a little scroll to eat. John said it tasted like honey in his mouth, but was bitter in his stomach. Yum. Maybe it should be obvious by now, but the meanings of the visions and prophecies in Revelation are far from clear. If you've read any other parts of the Bible, you know this is as mysterious and fantastical as it gets. Does that mean we should write it off, ignore it? That's safer, right? Wrong. Whatever your beliefs, assume for a moment that Revelation generally predicts what the future holds. After lots of turmoil of various sorts, God returns to earth. He judges mankind. Some are going to burn, and some will be eternally happy in God's city. I think we'd all rather be happy than burning. In that case, it's worth at least trying to understand how things will end. But even if you don't believe it, you have to admit Revelation tells a fascinating story. It was apocalyptic before apocalyptic was cool. People have been trying to understand Revelation for two thousand years. Every theory under the sun has been thrown at it. Four major ones have stuck. "[The beast] causes all, both small and great, both rich and poor, both free and slave, to be marked on the right hand or the forehead, so that no one can buy or sell unless he has the mark, that is, the name of the beast or the number of its name. This calls for wisdom: let the one who has understanding calculate the number of the beast, for it is the number of a man, and his number is 666." Rev. 13: 16-18. So who's this beast, this 666 guy? The four theories have four very different answers. Preterists believe that all or almost all of Revelation refers to what happened in the 1st century AD. The number 666 was a secret code used in Hebrew to represent the Roman Emperor Nero. The letters of his name in Hebrew (Nrwn Osr) add up to that number. The number was a warning, or a prediction, of the Roman destruction of the Jewish Temple in 70 AD. Historicists believe Revelation refers to church history. For example, Martin Luther believed many symbols pointed to the Roman Catholic Church. Maybe even the number 666. The pope’s official title is Vicarius filii Dei (Vicar of the Son of God). Those letters, when the Roman numerals are added together, total 666. This view is much less common today. Futurists believe most of the events are still to come. They keep an eye out for those seven scrolls, trumpets, and bowls. Anything with the number 666 causes them concern, as it might be a sign of evil or the antichrist. This is the most common view today. Idealists believe all that crazy stuff is crazy for a reason: it's literature, not past or future history. Revelation uses allegories to tell us something about the spiritual path and the battle between good and evil. Because the Bible uses 7 as the number of completeness and goodness, the use of 666 just emphasizes imperfection and evil. You could pick holes in any of those theories. As you might guess, the many images and metaphors of Revelation do not fit nicely into a single box. So maybe some overlapping version of those four theories gets at the real meaning. That's not very satisfying. We want to know what the future holds. We want answers! Instead, we get a story. A story with an ending open to interpretation. So, why not see where that story takes us today? We write and read about things we don’t understand because we might just catch glimpses of answers. That's a big reason why I wrote Unbound. It's a story that matters because it seeks truth, like all good fiction should. Here's the cherry on top: all that wild stuff and those four theories are not even the most controversial thing about Revelation. No, that honor goes to the Millennium. How and when will the ending come, and what does one thousand years have to do with it? We'll unpack that in the next post. It makes for a great story. Let's make our words count -- J.B.
Amazon Bestselling Author. Smart stories, epic ideas. Want to write better? Good. The world needs it. Check out these great tools. Sign up to get an epic free book and exclusive content from J.B. Simmons. Welcome! Get your free copy of Light in the Gloaming here.